Two of the cutest subjects for videos on the Internet have to be babies and animals. Put the two together and you'll get the ultimate coalescence of cuteness. After you've indulged in some kittens failing spectacularly, watch some of the most adorable, cute and funny puppy videos this side of the world wide web. Adults and kids alike are sure to love short videos of really cute puppies! Observe an innocent little puppy for any length of time and you'll inevitably be hit with a massive dose of delight that will truly melt your heart. 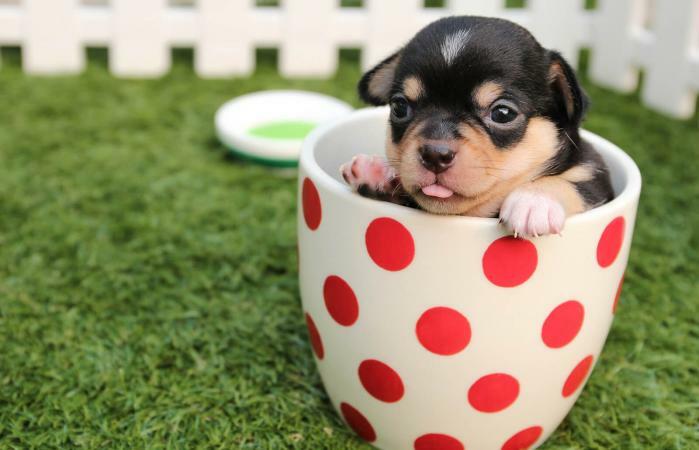 You can try not to laugh when viewing these super-cute and funny puppy videos, but chances are you'll let out more than a few chuckles! Feline fans might have Grumpy Cat, but dog devotees have Boo. The adorable Pomeranian is easily one of the most famous and adorable puppies on the Internet. He even has a book to prove it! If you have ever wondered if drowsiness is contagious, look no further than this video of a puppy who falls asleep next to its human infant companion. This baby and this puppy are sure to be best friends forever! What's cuter than an adorable ball of fur? A whole basket of adorable balls of fur! These Bichon Frise littermates are relaxing in a laundry basket when one of them decides that the camera is far more interesting. Unusual crosses between different breeds can yield overwhelmingly cute results. Case in point: these Pomsky (a cross between a Pomeranian and a Husky) puppies have the most adorable bright blue eyes. Puppies are encountering things in the real world for the very first time. The only way they learn is through experience and experimentation, as demonstrated by this little pup attacking a doorstop. Falling Asleep in the "Shower"
A mere two weeks old, this precious little one was rescued from a dumpster and has been in human care ever since. He is enjoying its "shower" in the sink so much, he's almost falling asleep! No one really understands baby babble, just as no one truly understands what a dog might be barking about. Put the two cuties together and they can engage in quite the discussion about who knows what. Kids are sure to love this video just as much as grown-ups! The English Bulldog may have a reputation for being a gruff and rough breed, but adorable little bulldog puppies are just as vulnerable as any other breed. Watch this wrinkly pup howl for attention. Cuteness overload! How old does a puppy need to be before she can learn tricks? As this video demonstrates, puppies as young as 12 weeks can already have a giant repertoire of commands and abilities, including shaking paws, looking sad, and leaping over legs! It has been said that there exists no greater divide than between dog people and cat people. But if a new mother cat can adopt an orphaned puppy, surely we can all get along too. Cuteness abounds when video captures precious moments of love between dogs and cats! As tiny pooches venture out and explore this vast world, they'll have many lessons to learn. This is true whether they're Golden Retrievers or a more quirky dog breed, but they're only going to be puppies for so long before becoming adult dogs. Treasure those precious little moments and capture them on video! Keep a few cute short puppy video downloads or a selection of cute and funny puppy pictures on your computer or mobile device as a quick and easy way to bring a smile to your face on even the most stressful day!